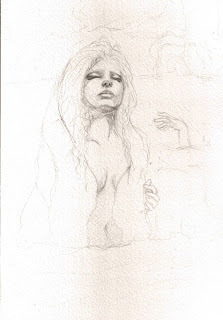 "Woman who fits in marsh-A rough sketch"
I drew a sketch a rough was woman, and painted only black. This technique is a peculiar technique to Japan. The sumi-e painting is a technique for drawing by one Indian ink color. But I didn't use sumi, and used a Holbein artists' gouache of black.